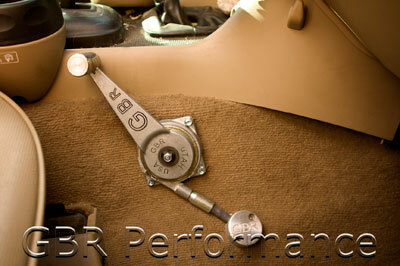 Great Basin Rovers offers a variety of options for tranfer case gearing for Land Rovers. Please contact us for more information. We are continually working on the transfer case site, not all information is completed. An LT230 (Leyland Transmission model number 230) transfer case is an extremely good transfer case. In our opinion, one of the best if not the best part of a Land Rover drive train. They are completely gear driven hence no chains to stretch or planetary gears to prematurely fail. As a result they are very durable. They are actually as strong if not stronger than some aftermarket transfer cases such as the Atlas brand. They also have a fairly steep low range ratio at approximately 3.4 to 1. All versions have this same ratio although there are several different high range ratios available. With stock tires and differential gears, this low range ratio gives you a very respectable crawl ratio of approximately 40 to 1. In spite of this fairly low, low range ratio, with the advent of much larger tires and very challenging terrain, many people find they need/want a significantly lower gearing. We offer two kits to resolve this issue. Our first kit is approximately a 30% reduction is gearing for low range. This kit reduces it to approximately 4.3 or as noted about 30% lower. Our second kit is approximately a 50% reduction in gearing for low range. This kit reduces the low range ratio to approximately 5 to 1. The kit includes the replacement intermediate cluster with new bearings, the low gear wheel, new intermediate seal and two output seals. Also included are a new drain plug and tap to install it and comprehensive instructions. For durability reasons the design of the gear teeth of the low range portion of the set are straight cut spur gears instead of helical cut gears. Straight cut gears are much more noticable in operation than helical gears although these are engaged only in low range. The high range gears remain as a helical design hence there is no difference in operation. Our experience and opinion is that the more noticeable low range gear noise is not an issue because normally if you are in low range, you probably have more on your mind than listening to gears! Many people report that they prefer the increase in sound for challenging off roading because you have more immediate feedback on what is happening with the vehicle. The result is that you can react to changing off road conditions quicker. Examples are bogging down in soft conditions or losing traction. You hear it instantly and can react sooner. To order the correct kit for your transfer case it is important to specifically identify exactly what LT230 you have. All LT230’s are very similar externally and most can be interchanged easily. Unfortunately there are many internal differences such as tooth counts, gear cross sectional differences, dog clutch teeth profiles etc. It is critically important to use the correct combination of components. The new intermediate cluster is actually built using core intermediate clusters so a core return of your existing intermediate cluster is required. The low range gear is machined off and the new on is permanently installed. We supply a UPS return tag for the convenient return of the core. We have developed our own Center Differential Locking kit (CDL). We previously supplied and electronic version and have studied all of the available options that are now or have been available and have come up with our own version, which we feel addresses all of the issues. We feel we have come up with the simplest, most reliable, easiest to install kit and esthetically attractive kit on the market. $349.95 – CDL Activation kit, includes shifter, brackets, cable, installation instructions etc. The obvious question is – why do I need to add a functioning CDL to my Discovery 2. The answer is that a lockable center differential is the single most effective off road performance upgrade one can make to a Discovery 2. All subsequent off road upgrades will work better with a functioning CDL. Also a functioning CDL will increase the durability of other stock drive train components such as the axle differentials. One of the huge advantages to our kit is that you do not have to remove the center console of the vehicle. Thus making installation a lot quicker and less expensive. Kit can be used for the following vehicles. 1 – purchase the individual components and add them back into your transfer case. 5 – If you don’t own a D2 yet but are contemplating purchasing one, specifically purchase one already equipped with one. Number 4 & 5, might seem like radical solutions but we included them to emphasize how important this component is to a high performance D2. Also adding CDL back into the vehicle can be expensive. A quick check to see the staus of your existing t/c is to check the serial number of your transfer case. It is located on the back below the round PTO cover. Note use this information as a general guide and always verify that you have a compatible transfer case. Here is a full proof method of determining if you tell if you have a compatible transfer case. We recommend do this even if you have checked serial numbers. 1 – BW transfer cases are very expensive to purchase as remanufactured and I personally wouldn’t buy one used. 2 – An LT230 transfer case is an all gear driven and very durable unit and for this reason, it lends itself very well to high performance applications. Note – we do not recommend wholesale removal of properly functioning BW’s because as long as they are properly functioning, they work quite well. 3 – Used or remanufactured LT230 transfer cases are quite common and cost substantially less than comparable BW’s. Due to their durable construction, they are usually a safe bet to purchase as used. 4 – Conversion is relatively straightforward, especially with our CDL kit. Note if you purchase a used LT230, specify that you want both of the mounting brackets, as one of them is different from the BW. If you don’t get them, you will need to purchase one of them and why incur any additional expense. Also not that early RRC’s may need an updated coupling shaft with extended splines to be compatible with a later LT230. Contact us for technical information.